Product #21190 | SKU 046004 | 0.0 (no ratings yet) Thanks for your rating! 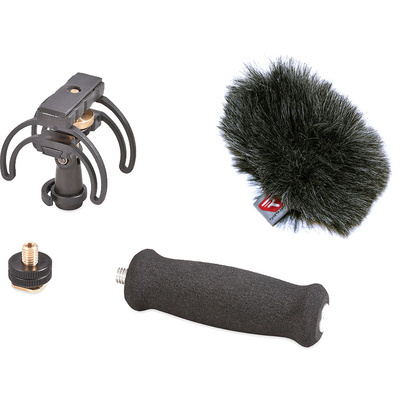 The Rycote Portable Recorder Audio Kit for Olympus LS-10/LS-11 is an ideal solution for users of the Olympus LS-10 or LS-11 digital recorders who want to capture clean recordings outdoors. The kit includes a suspension mount, a Mini Windjammer windshield, a soft-grip extension handle, and a swivel adapter. The suspension mount and windjammer minimize the impact that handling and wind noise can have on a recording, while the soft-grip handle provides extended reach and comfortable handling. The 180° swivel adapter connects to the recorder's threaded mounting socket and allows you to point the recorder exactly where you want it for clear audio pickup.